Two shoppers on Bury Market are enjoying some extra Christmas cheer thanks to their knowledge of the festive season. David Procter (1st place) and Julie Pitchforth (2nd place) have taken home a Kindle Fire and a Kindle E-Reader after scoring top marks in the market's annual Christmas Quiz. The quiz attracted hundreds of entries, and few people managed to complete all the questions. The winner was chosen by a tie-breaker of 15 words on why they would recommend Bury Market. David's winning entry read: "Wonderful, old-fashioned market. Everything you need at bargain prices and service with a smile." Markets manager Andrew Heyes said: "I couldn't have put it better myself!" 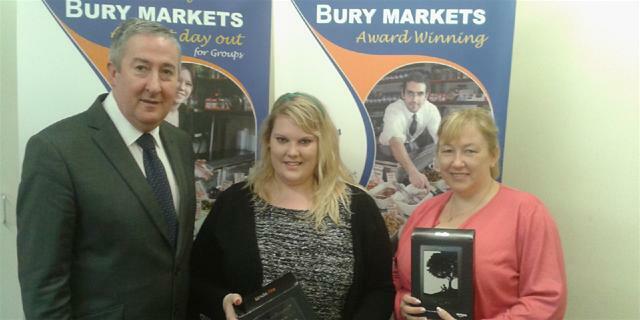 Pictured: Katie Procter (daughter of 1st prize winner David Procter) and Julie Pitchforth (2nd prize winner) are presented with their Christmas Quiz prizes by markets manager Andrew Heyes.